Senior Infant Adventures in Learning: Even Teachers Need Their Space! Even Teachers Need Their Space! 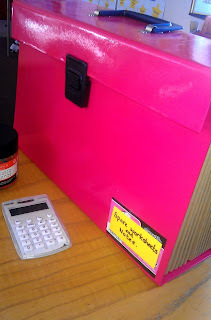 As I jump in, head first, into a new school year, the one thing I have decided to be is... MORE ORGANISED! (Sound familiar??) As a result, I spent quite some time planning how I was going to organise my classroom this year, with the motto: "A place for everything and everything in its place" driving my quest for a less stressful, more organised environment for myself and the children. Not only have I labelled every cupboard and storage spot in the room, but I have spent a lot of time rethinking my filing systems and teacher 'things'. Hopefully you will find the following ideas useful as you are in the midst of organising your own classroom and hey, if nothing else, I always enjoy getting a peak at people's rooms and desk space (probably the artist in me!) so maybe you are the same! I love being able to see everything I have for easy access, as opposed to having to search through a drawer for a marker, pen etc. I know this may not be to everyone's taste, but it works for me! I still use my drawers for storing blue tack, my whistle, sweets, my stapler, mini post-its for the children and other things that cause a lot of clutter. As far as plans and records go, I only keep two notebooks on my table. I have an A5 one for my daily lesson notes, as I find I can bring it around in my handbag and bring it home easily in the evening. It also doesn't take up a lot of space on my desk, as sometimes my desk can turn into a dumping ground during a particularly busy day! (Often I have to make an effort to tidy up while the children are eating during lunch or I'd never be able to find anything!) I also have an A4 project book for keeping anecdotal records on the kids. I have the divider sections labelled with the children's names: A-C, D-H, etc. in it. Inside is labelled with the different subject areas and also has compartments for school notes, notes to parents, staff meeting notes and busy bee worksheet master copies. I like this a lot so far as it means I don't have to go searching through folders whenever I need to put something away, as more often than not, I will just throw the sheet in a drawer if I don't have an easier option. Beside this box, I have all my little buckets. I prefer buckets to those stationary storage containers you can get because, inevitably, I will run out of space for the many items which end up in there. I got the first in Ikea and use it to store all my spare pencils for the kids. (I have seen people paint these buckets if you want to get really creative, but who has the time??!) The rule is: if a pencil is facing nib up, it is pared, and if it is nib down, it is not. I have a child whose job it is before break times, to pare the blunt pencils. I have another bucket I got as part of a chocolate gift package one Christmas which I use to store scissors, pens, highlighters, markers, tippex, etc, and a plastic cup with a handle for the children's whiteboard markers. I also have a box of elastic bands, a pencil sharpener, a box of paper clips, post-its and a cute pig timer I picked up in Dealz. I go through little sweet tubs in school so fast and they also make really good storage containers for your desk. I use them to store thumbtacks, staples and the like. 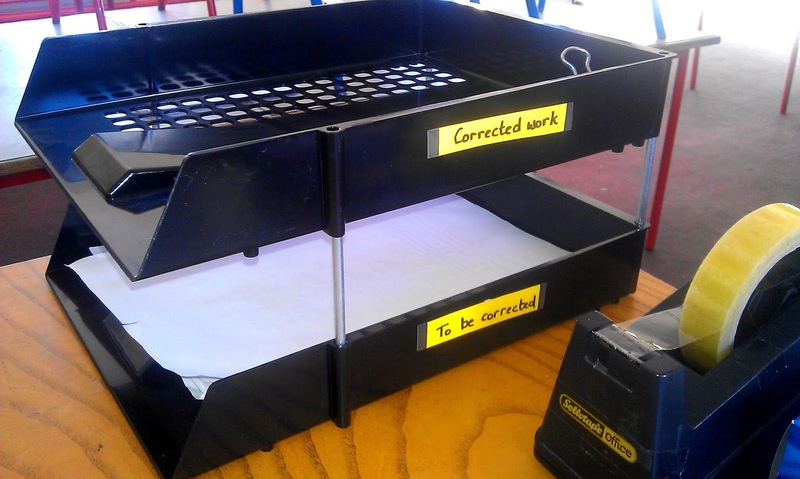 I invested in some paper trays this year also to store my 'corrected' and 'to be corrected' worksheets. Anything to encourage me to correct the work quickly is a good thing! Never forget about the practical things in a classroom! 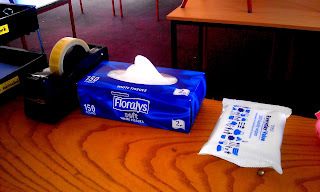 I have tissues and anti - bacterial hand wipes (these come in more handy than you realise for after-art activities and general hand hygiene for me and the kids!). 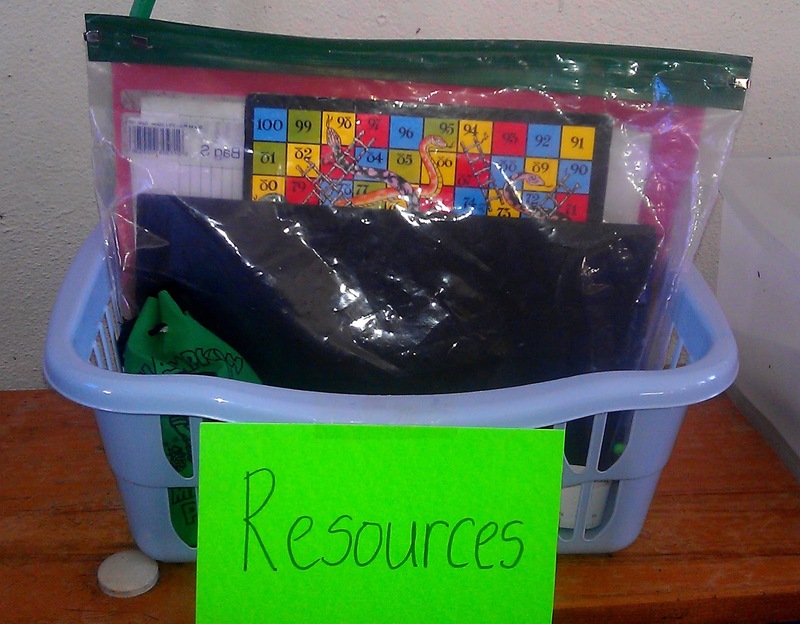 Behind my desk I have a bench area and on it I keep this basket for resources. I put in the following day's teacher textbooks and resources in this basket for easy access the next day. It is so much easier to have everything you need in the one place! My teacher bookshelf is quite far away from my desk which is annoying, but I have labelled the books by subject area so that I can find what I need as quickly as possible! Now, some people may laugh at this idea, but I hide it under my desk for my own comfort! 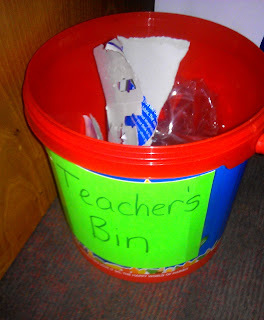 It's my Teacher's Bin! Again, this is a tub I bought Haribo sweet packets in and I like it as a mini bin because it is quite small but also pretty deep. I am lucky enough to have quite a large classroom, but my numbers are in the 30's and with all the tables, the children are pretty hemmed in! I store the bins at the back of the room because I don't want the children distracted by other children at the bin and to keep bin smells far away from me, but, as a result, it is not easy to get to! 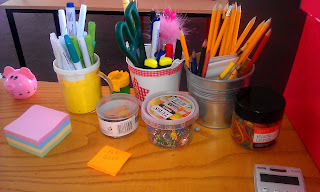 I find the teacher bin handy for used post-its, and the other small things that accumulate on the teacher's desk during the day, especially if you are using your desk for reading groups/tin whistle groups etc! The final things I have all around my desk are my precious checklists! I have the ones I use everyday stuck to the desk, hidden from view (words/sounds), and other ones like maths test results and P.E. observations stored in a proper assessment folder. I keep things like my classlist, timetable, allergy information and a checklist for incomplete homework in this folder so far also. Eventually, I will sort out some sort of a substitute pack in case I am ever out, but that may be on my to do list for a while yet! These are some sorting strategies that I find work for me, but everybody's different! Don't be afraid to share any good organisational ideas you may have in your room in the comments below, as I'm always looking for new ideas! 'Like' or 'Follow' Senior Infant Adventures!